In a continuing European trend of infrastructure asset acquisition within the current climate of low interest rates, London-based venture investment company 3i purchased George Best Belfast City Airport at the close of 2016 for an undisclosed sum. The airport, a component of a wider portfolio of assets previously held by Eiser, has been valued at an estimated £100 million. The investors within Eiser’s Global Infrastructure Fund have the option to continue investment in the assets, including the airport, through a new reinvestment fund established by 3i, subject to minimum and maximum uptake. It is estimated that approximately £20 million was made available for improvements under Eiser’s stewardship. 3i, Britain’s biggest listed private equity group, comprises three complementary tiers: private equity; infrastructure; and debt management. Among the airport management is a hope that the new ownership will seek to invest and enhance the existing facilities. The financial transaction is expected to reach a conclusion in early 2017 subject to an approval under EU merger protocol. Over the past two decades the airport has changed hands several times. Purchased from Bombardier by the Spanish Ferrovial Group in 2003 for £43 million, before a subsequent takeover netting roughly £132.5 million in 2008 when it came under the ownership of an ABN Amro fund group. 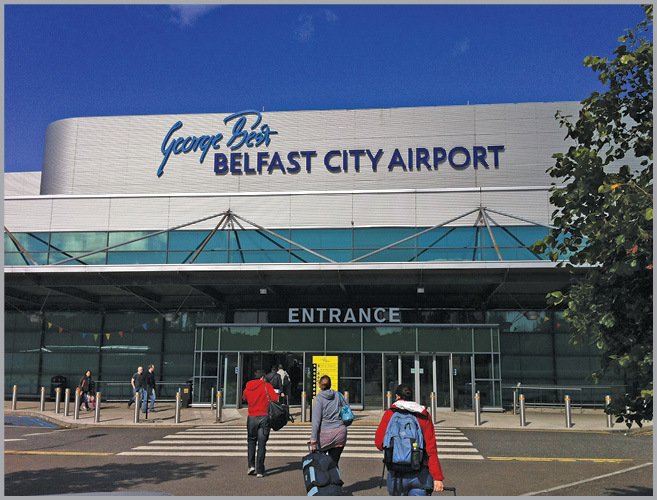 In 1983, the airport recommenced operating commercial flights under the initial guise of Belfast Harbour Airport before re-designation as Belfast City Airport and latterly became George Best Belfast City Airport. Previously, Belfast City Airport Chief Executive Brian Ambrose had anticipated that passenger numbers would exceed four million in 2020. Currently, however, the sale of departure seats currently remains capped at 2 million passengers due to a planning restriction. 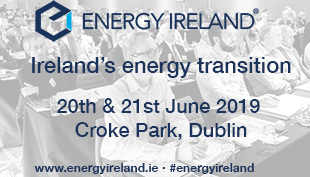 In a letter to the Finance Minister, the Infrastructure Minister, Chris Hazzard indicated his decision to lift this cap following the implementation of recommendations made by the Planning Appeals Commission resulting from a public inquiry conducted in 2015. A spokeswoman for the Department for Infrastructure stated that this was “subject to resolving the technical issues around the proposed noise-management system”. 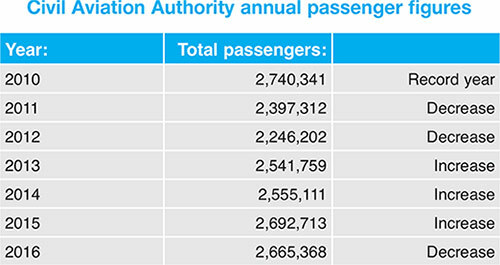 According to Civil Aviation Authority figures, Belfast City Airport has yet to match or better its annual passenger figures (including both departures and arrivals) for 2010. Despite surpassing or at least equalling the 2015 figures in the summer months, the 2016 statistics indicate an overall decrease in passenger numbers, falling 1.2 per cent below the previous year. This decline has been attributed to the loss of a connection to London Gatwick.